The new C7 Corvette is one of the most anticipated cars coming out this year. GM’s financial problems kept a new Corvette off the the table, leaving the C6 in production for nine years, long enough that even Chevy’s own Camaro SS was starting to threaten the Corvette’s dominance. Now with nearly a decade of technological advancement to catch up on, the latest ‘Vette is lighter, faster and more fuel efficient. Although an overhead valve engine may seem antique compared to the twin overhead cam motors used by competitors, GM has stuck by this design because it’s extremely compact. More displacement may be needed to make power, but their power-to-weight ratio is better than anything coming Germany or Italy. Ever seen a direct injection pushrod motor before? You have now. The new Gen 5 engine may be seen as a continuation of the brand’s legendary small block, but it’s an entirely new design sharing almost nothing with its predecessor. This is the first small block to get direct injection, while a redesigned combustion chamber allows the engine to use a 11.5:1 compression ratio on pump gas. Overall weight is up 30 lbs, mostly due to the the mechanical fuel pump needed to feed the injectors. The base 6.2 liter engine produces 450 horsepower at 6000 rpm and 450 lb-ft of torque at 4000 rpm, virtually identical to the old Z06. Note: This engine is going to be available from GM’s performance engine division very soon – check GMPartsOnline.net for the new part number. Fuel economy has always been a strong point for the Corvette, and this version sees the addition of cylinder deactivation to maintain high mpg numbers. Cylinders 1, 4, 6 and 7 get deactivated, leaving two inner pistons on one side and two outer pistons on the other operating. This provides better balancing than systems that deactivate one side of the engine, reducing vibration. 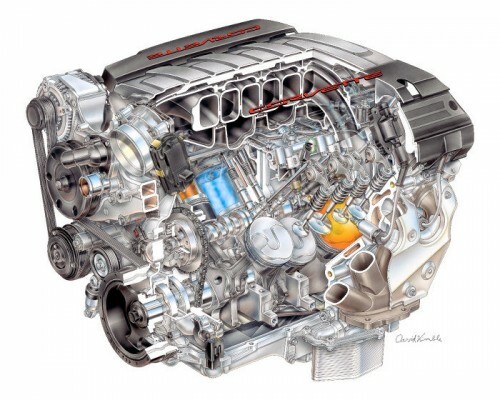 Part of the reason GM engineers chose to stick with 6.2 liters of displacement was to increase the amount of power available during cylinder deactivation. This lets the engine stay in four cylinder mode longer, increasing overall fuel economy. Several steps have been made to ensure durability, giving both GM and tuners a good starting point for improved performance. The first engines will be wet sump, but dry sump oiling is planned for high output versions. The cylinder sleeves are overlapped at the top by the engine block, providing a flat aluminum surface for a better seal with the head gaskets, and a new PCV system allows for more oil to be recovered from the piston sprayers. Capping this off is a new variable pressure oil pump that will keep the engine well lubricated regardless of RPM. This improved oiling and sealing also means that GM is willing to honor the car’s warranty if the car is used on the track. While the Corvette is one of the first GM vehicles to have an all-aluminum frame, expect to see this technology across GM’s line-up over the next decade or so. The C7 uses an entirely aluminum frame which weighs almost 100 lbs. less than the C6’s steel and aluminum structure while increasing torsional stiffness by 57%. 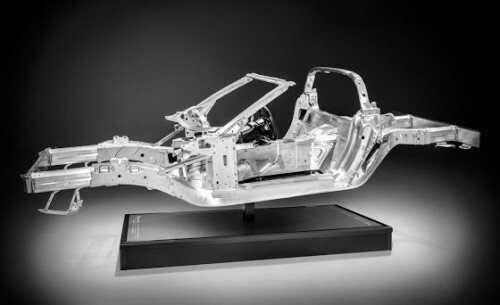 Like a high quality bicycle frame, the Corvette’s frame components vary in thickness to provide just enough strength throughout the structure while keeping weight to a minimum. Attached to this frame are hollow cast front and rear cradles that weigh 25% less than the C6’s solid units. The styling may be controversial, but the result is better airflow undercutting the current car’s 0.34 coefficient of drag. No official number has been released, but Callaway says their planned shooting brake version should come in at 0.23 CoD. Each piece is designed to match the structural and manufacturing needs of both fiberglass and carbon fiber, allowing one to be exchanged with the other depending on weight and cost needs. The base model will come with a carbon fiber hood and roof panel, while top end models could have an entirely carbon fiber body. GM is working with Plasan Carbon Composites to make carbon fiber pieces for the C7. They have a new manufacturing process that cuts per-part processing time down to 17 minutes per part, greatly decreasing costs. This should open the door to more carbon fiber being used across the line while maintaining the Corvette’s price point. The doors and fenders weigh 37 lbs. less thanks to thinner panels: 1.2 mm thick for the outer panels and 0.8 mm thick for the inner panels. Despite the decrease in material, the panels are more resistant to thermal expansion, allowing for narrower panel gaps. What do all these technical improvements mean? A heavier engine and interior are counteracted by a lighter frame and body. The curb weight will be lower than the C6 Corvette, coming in somewhere between 3,000 and 3,100 lbs. 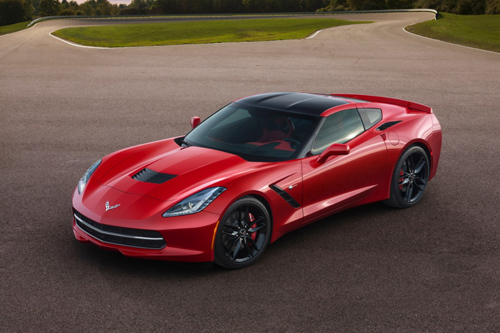 Acceleration for the base model will be at least as fast as the C6 Z06. EPA fuel figures have yet to be released, but the car is expected to get 28 mpg on the highway. A priority on strength and durability in the Gen V’s engine design will give plenty of room for performance versions. I am writing a self-help book. I would like to use the image of the C7 above in my book but I would like to request formal permission to do so. The use is all positive as I am a HUGE Corvette fan. Because this is a self-funded effort I really don’t have a lot of funds available. If you require payment I completely understand and will attempt to find another image elsewhere. If this is not the proper point of contact I would appreciate you putting me in touch with the appropriate party. David – Pretty sure that’s a GM press photo. You’d want to contact someone at GM’s media center and see if you can use the pic that way.